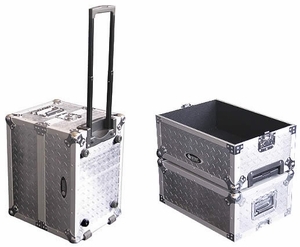 Our diamond plate LP case features recessed wheels and a pull-out extendable handle for smooth, effortless transport. The half-split design allows better access to LPs. Heavy-duty ball corners, recessed handles and latches, and 120+ LP capacity.